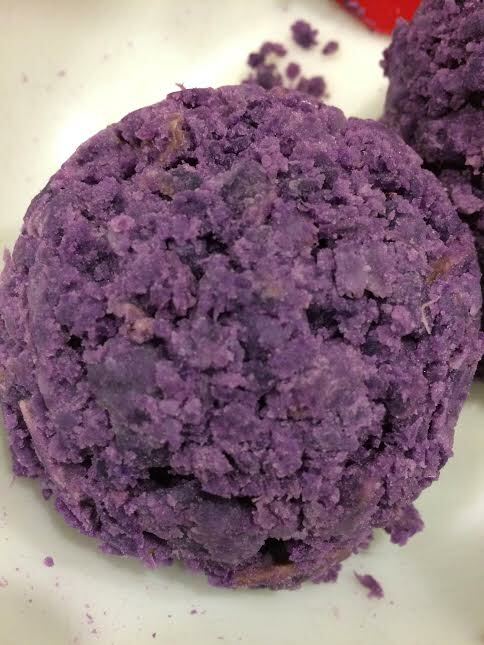 Among the many foods that Hawaii imports (read: everything), the Okinawan sweet potato, known as beni-imo in the Okinawan language, is commonly used in desserts and side dishes. In Hawaii, it is sometimes combined with coconut-flavored pudding (haupia in the Hawaiian language) to create an orgasmic dessert filled with happiness, rainbow-farting unicorns, and fairies. If you love sweet potato and/or coconut, I suggest you give this recipe a try! It’s somewhat laborious but is entirely worth it. Photo courtesy of Miss Mochi. 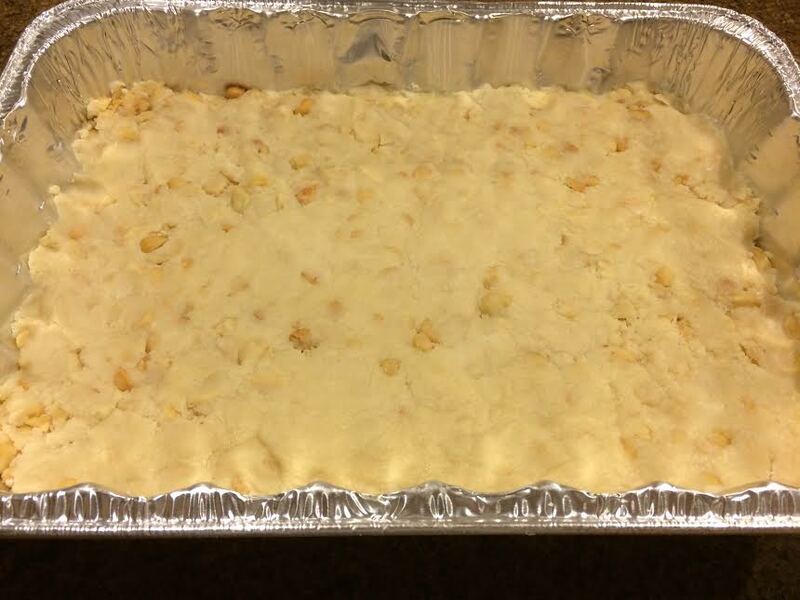 Miss Mochi’s recipe, below, yields enough pie for 13″ x 9″ or circular pie baking pans. See ingredients, directions, and step-by-step pictures behind the cut! Many ingredients go into this epic creation. After successfully foraging the grocery store (and perhaps even the wilderness) for your ingredients, gather your two or three potatoes (I get three medium-sized ones to be safe). Time-saving and competent Miss Mochi cuts her potatoes into chunks and microwaves them whereas I bake my potatoes whole in a toaster oven at 350 degrees Fahrenheit for 50 minutes. It’s not that I fear radiation; I simply create havoc whenever I attempt heating something up for longer than 60 seconds so, generally, my microwave only sees popcorn and leftovers. If you do throw your potatoes in the oven, be sure to impale each potato at least 285,387,898 times each with a fork so that they don’t explode when heating up. I cook them whole, peeling the skin off only after they’ve cooked and cooled. 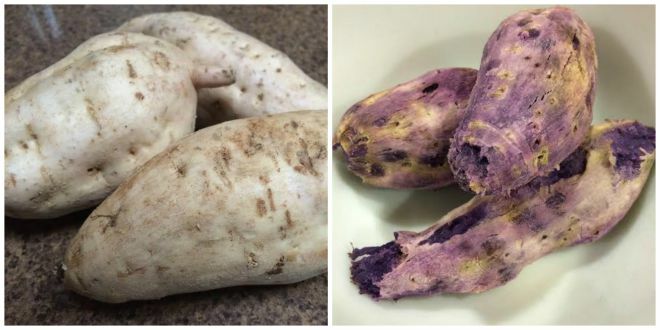 Okinawan sweet potatoes, before and after baking. Mix the dry crust ingredients together in a bowl and add the butter, “cut” into smaller blocks, as well as the chopped macadamia nuts. I’ve never tried other types of nuts but imagine that they work well, too. Mix all four ingredients well and press the resulting crumbly raw crust matter into your baking pan. Bake for 15 minutes at 350 degrees or until golden at the edges. Though the raw ingredients were on the crumbly side even when mixed, the final product smelled and looked just fine. Once the potatoes are done, take them out of the oven and set them on the counter to cool. I let them cool for a good two hours prior to mashing as I do not own an electric mixer and mash by hand (and have low tolerance for extreme heat). Once you have mashed the potatoes, they are brilliant and beautiful. Purple is so damn tasty. In a separate bowl, mix our dry ingredients, butter, and eggs. Add the two mashed cups of sweet potato and mix until creamy. 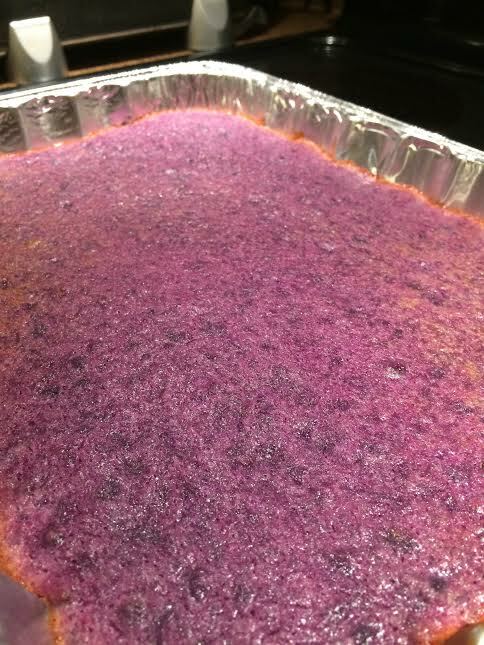 Add the evaporated milk and vanilla extract last, mixing until you’ve a beautiful vat of wonderful purple awesomeness sitting before your eyes. Pour it into the pan containing the cooled crust. Bake for 30 more minutes at 350 degrees then let it sit until cooled to room temperature. Start making the haupia layer once the beni-imo and crust have cooled. 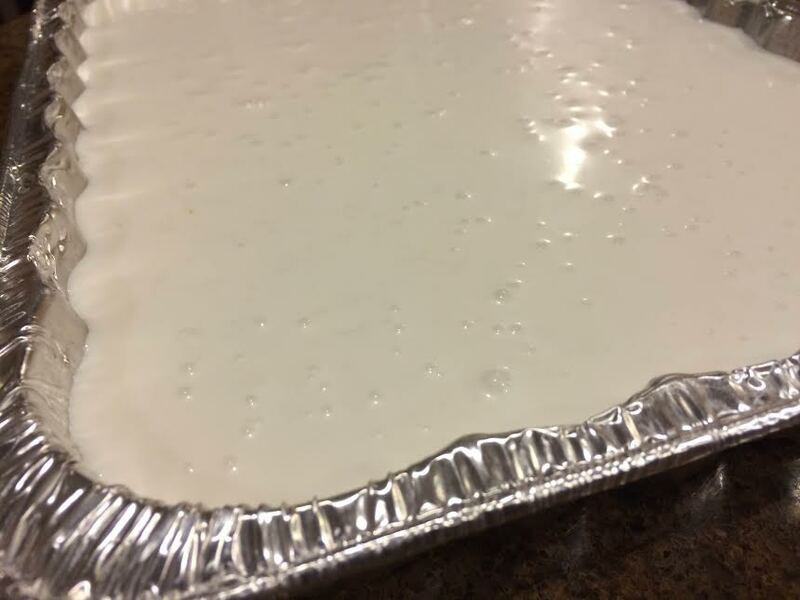 (Fun fact: true haupia uses traditional ground Polynesian arrowroot, “pia,” as a thickener for the gelatin dessert. As ground pia is not easy to come by, haupia is nowadays often made with corn starch.) 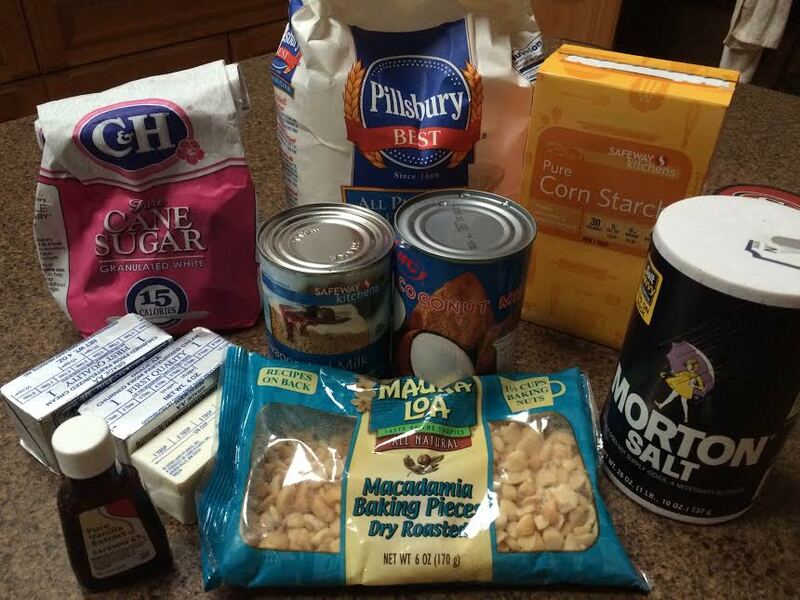 Dissolve the corn starch in water before adding the sugar. Pour this smooth mixture into a small pan containing the coconut milk. Heat while stirring all of our haupia layer ingredients until it has thickened. No more than a few minutes on light-medium heat should suffice over the stove. Don’t heat for too long or the ingredients will begin to clump. Pour over the sweet potato layer and refrigerate. It should be ready after six hours; let it sit overnight to be safe. There were some bubbles after pouring our haupia layer in. You should wake up to a pan of greatness seated in your refrigerator. 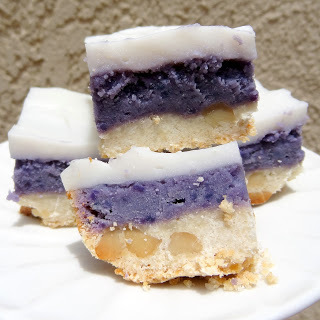 You can cut the finished product into individual squares. Enjoy! Beni-imo is visually stunning, delicious, and abundant in Hawaii and West Coast Asian markets. In Eastern and Southeastern Asia, beni-imo is often combined with bread, ice cream, sweets, and pastries. I’ve yet to successfully craft a beni-imo cookie that doesn’t have the consistency of a scone. 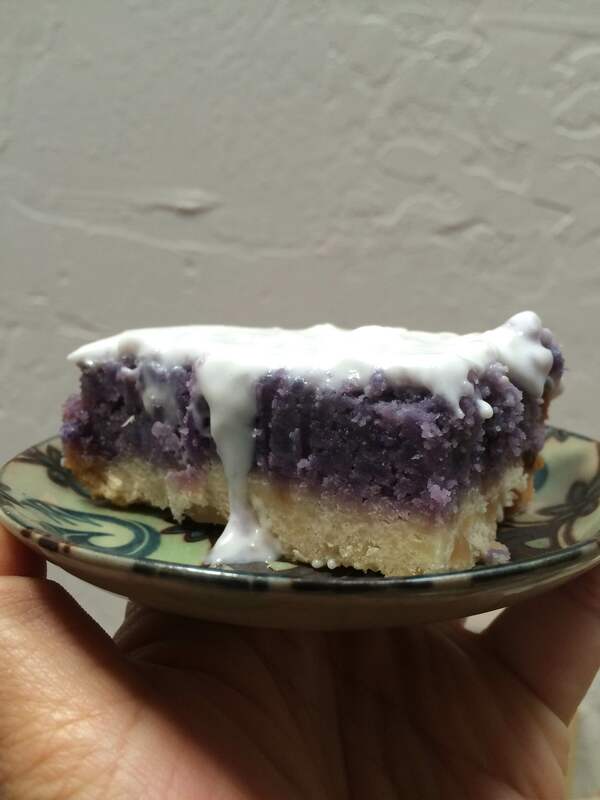 Do you use Okinawan sweet potato in your dishes and desserts? Let us know! And may you labor victoriously with your pie and enjoy the spiritual experience of consuming beni-imo while reading this blog!